I watch way too much HGTv. On the rare instances that I get control of a television and actually have time to sit down and watch it, HGTv is what I naturally turn to if there's nothing on that's just begging me to watch it. When I was on "couch rest" for the last few weeks of my pregnancy with Ty, it was all that I did. I'd go to work for the morning and then I'd come home at lunch, get my feet up (as per doctor's orders) and watch HGTv until it was bedtime. I should be the HGTv queen. And if Ty absorbed anything in-utero, he should be a jack of all trades like his PaPaw. I like house designs, interior design, and repurposing. I love the blogs that show how they take a little flea-market find that looks like it's better days were a hundred years ago and they turn it into this brilliant and completely adorable piece of useful furniture or decoration. Projects like that just speak to me. So it's probably no big surprise that when I look around at houses, my eye goes toward older houses who have seen many years come and go but still have good and beautiful bones. I love houses with old fashioned accents. The double entry where you walk in one set of double doors into a closed-in entrance porch of sorts where another door that leads into the house can be found. Preferably another double door. I love the old ways when the outer doors were opened when the owners were receiving visitors, and closed to show that the household was unprepared for guests or gone to bed for the night. Or the houses that have a porch with an arched entrance that leads to a entry door that is also arched. I like English, Victorian, and Gothic style arches on a roof. 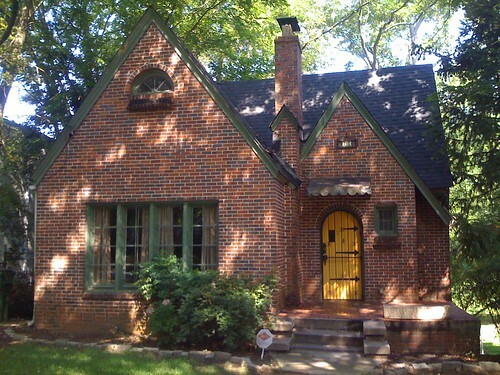 I love brick and stone houses that look like they should be taken out of an 18th or 19th century English novel. I say I will always want a single level house, but if I were to have a staircase, I would want it to be rounded. If I had two staircases leading to the same level, I would want one to be spiral. Because my childhood home had a spiral staircase and it was magical. It was something straight out of a castle in my child's mind. Even though I have a house-full of perfectly good furniture, I drive past the second-hand stores in town and see furniture sitting out in front of the store and think of the new life that a coat of paint or new hardware could give it. And the money that could be saved! I'm all about saving money. And I'm all about these old houses. Jason will even tell you that I almost killed him while driving (and fully in control of the vehicle) when I gasped suddenly and declared my love for a house he'd never before noticed. Let it be stated the only thing he would have died from was surprise. I love old houses with character and history. 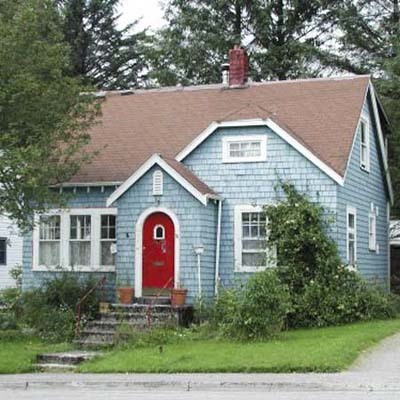 I love the idea that a fresh mind, a couple coats of paint, and a little spit-shine can make an old house a new home.